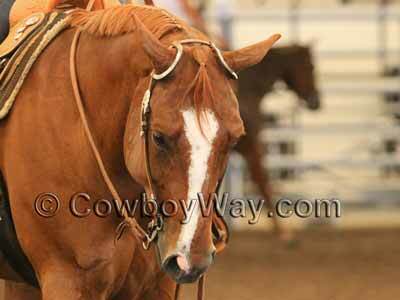 Instead of a browband, a double ear headstall has an ear piece that goes around each of the horse's ears. The ear pieces not only keep the crown of the headstall from sliding down the horse's neck, they provide a place to include attractive additions to a headstall. The ear pieces on many double ear headstalls are tooled, braided, or adorned with silver or other eye-catching accents. Below are double ear headstalls for sale on Amazon and eBay. 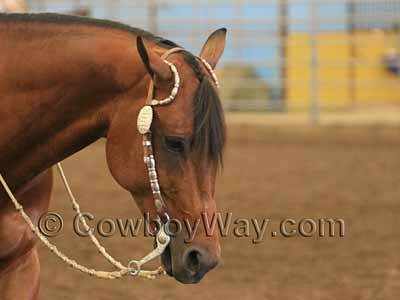 Below: A double ear headstall with the ear pieces covered in silver. Double ear headstalls are a favorite for the show ring or any other "dress up" occasion. 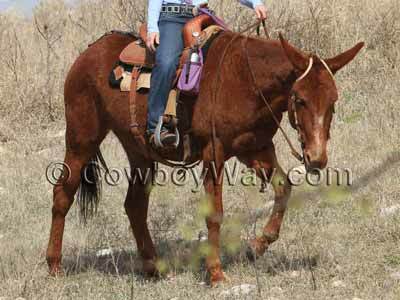 Typically, each ear piece on a double ear headstall is made to slide independently. This allows the ear pieces to be slid along the crown of the headstall to the best location to fit that particular horse's head and fit around each ear without rubbing. Below: A fancy show headstall with rolled silver on the ear pieces. Below: A mule competing in an obstacle course trail ride wears a double ear headstall with braided ear pieces. If you find a double ear headstall you like but you're not ready to purchase it right away, you can always add it to your shopping cart so it will be easy to find later. In most cases, Amazon will keep track of your headstall, and anything else in your shopping cart, for 90 days. Later on, if you decide you don't want the item(s) after all, it's easy to click "delete" and remove them from your cart. In the meantime, if you want to check out with other items, click "Save for later" to move the items to a separate, but still easy-to-find list beneath your shopping cart. Important: Putting a double ear headstall in your Amazon shopping cart or "Save for later" list does NOT reserve it! It just makes it easier to find if it's still in stock when you come back.